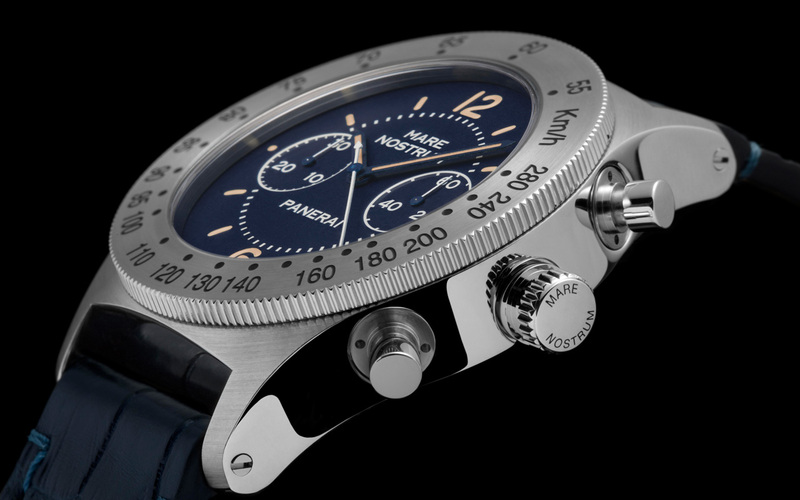 The latest model to be launched by Panerai, the 42 mm stainless steel Mare Nostrum chronograph, has a rather interesting history. The details about its origins are a bit blurry, it is actually based on the prototype of the first Panerai chronograph from 1943, intended for deck officers of the Royal Italian Navy. That was a huge 52 mm piece with a flat brushed bezel engraved with a tachymeter scale. 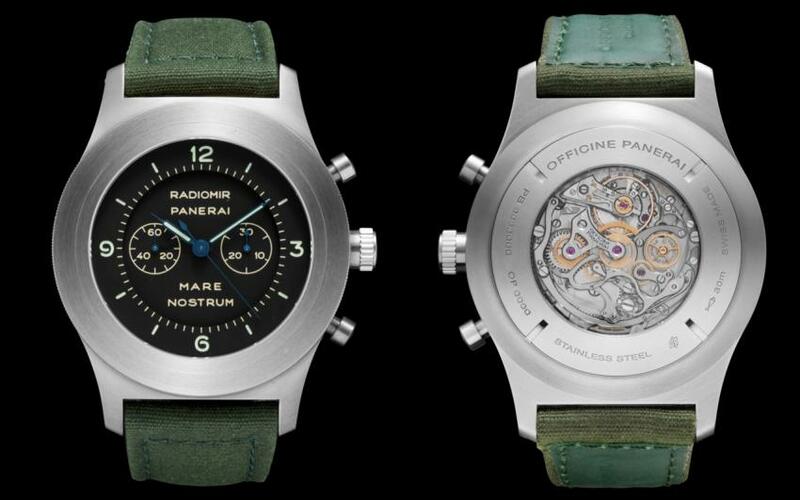 It never got to be mass produced, there were only a few prototypes that have survived, one of them being acquired for the Panerai Museum a few years ago. Until that point, there was limited information available about the Mare Nostrum, the 1966 flood in Florence having washed away the Panerai archives. 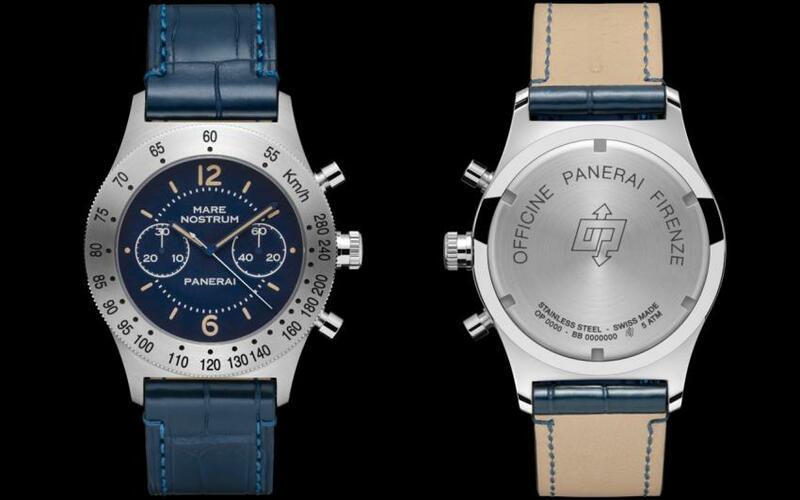 It was based on this limited info that Panerai launched the first re-edition of the chronograph in 1993 (Ref. 5218-301/A), in the first year of the period known to Paneristis as pre-Vendôme (pre-Richemont). Not having all the details about the original model, the 1993 version was a bit different especially its size, having a more wearable 42 mm diameter. Later, in 1995, Sylvester Stallone, the man who started the Panerai craze, commissioned several watches, that wear the Slytech inscription on their dials, among them the “Slytech Mare Nostrum”, the 5218-302 which has a tachymeter bezel and the highly sought-after limited edition 5218-304 that has a plain bezel. It was the plain bezel Slytech Mare Nostrum that inspired the PAM300, launched in 2010, with the same monster diameter as the prototype from 1943, 52mm. There are other design elements that follow the old prototype, such as the layered dial and the Radiomir inscription at 12 o’clock. And finally, here we have the Mare Nostrum Chronograph returning to the more restrained proportions, and in general, a lot closer to the 1993 Ref. 5218-301/A model than the chronograph from 1943. It has the same dark blue dial like the 1993 model with the minute counter at 9 while the small second is at 3 o’clock. The engraving on the dial and the markers are coated with beige Super-LumiNova bringing an aged allure to the dial. They also share the same movement, the COSC certified OP XXXIII calibre which is an ETA 2801-2 base with Dubois-Dépraz chronograph module. There is a tiny detail that will make the PAM716 easily distinguishable, the crown is engraved with the words Mare Nostrum. The PAM716 is limited to 1000 pieces and it will retail for $10,200 US. It’s not exactly the piece that will be the first choice of an aspiring PAM collector but for sure it will be an interesting addition to the more seasoned collection.